A heartwarming moment of bipartisanship at former President George H.W. Bush's funeral was so quick many might have missed it. Many eyes were tuned into the body language when President Donald Trump and first lady Melania Trump arrived and came face to face with their predecessors and his former rival. 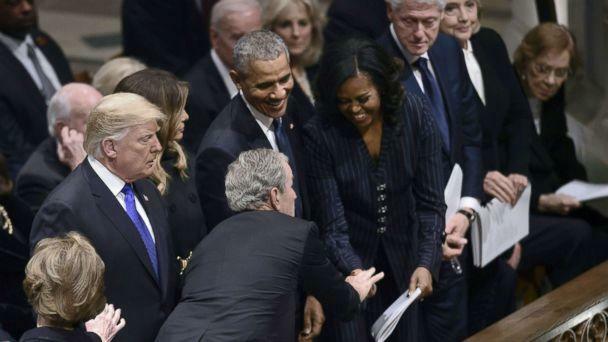 However, shortly after that, when former President George W. Bush arrived with his family's delegation and came to say hello to the other 'formers', he appeared to put his hand in his pocket before approaching the first pew. He then seemed to put something in his right hand before shaking hands with former first lady Michelle Obama. It was not immediately clear what he held or if he handed it off. He previously passed her a cough drop when they were seated next to each other at Sen. John McCain's memorial service at the National Cathedral on Sept. 1. "I didn't realize at the time that anybody noticed what we were doing," Michelle Obama later said about the McCain funeral during an interview on Today. She said that she and Bush "are forever seatmates, because of protocol, that's how we sit at all the official functions so he is my partner in crime at every major thing where all the 'formers' gather." "He was getting a cough drop from Laura and I looked over and I said 'Hand me a cough drop' and he was like 'Oh okay,' and I will add that they were old cough drops. That's the funny thing because they were in the little White House box, the little Altoids. I was like 'How long have you had these?' and he said 'A long time, we've got a lot of these,'" Michelle Obama said on Today. 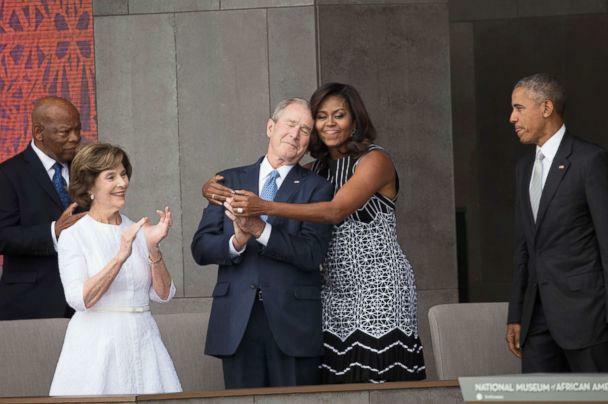 The connection between the two has been clear at various public events, including during the opening of the National Museum of African American History and Culture in 2016, when the pair shared a big hug. "I love him to death. He's a wonderful man, he's a funny man," Michelle Obama said of George W. Bush during that Today interview.